The kinetics of the dissolution of the equiaxed alpha phase into the beta matrix in Ti-6Al-4V were established and modeled for both isothermal (constant temperature) and transient/continuous heating conditions. For the isothermal experiments, samples were solution treated at a subtransus temperature to equilibrate the microstructure followed by rapid, direct-resistance heating to a temperature either 25 K or 78 K (25 °C or 78 °C) above the equilibrium beta transus and held for times ranging from 1 to 32 seconds. Dissolution behavior under transient conditions was determined in-situ using an indirect-resistance furnace and X-ray (synchrotron) source; these trials comprised a similar initial subtransus solution heat treatment followed by continuous heating at a constant rate in the range between 15 and 135 K/min (15 and 135 °C/min) to a temperature lying 25 K (25 °C) above the transus. Measurements of the temporal evolution of the volume fraction of alpha were interpreted using numerical simulations based on the Whelan dissolution model modified to treat a distribution of particle sizes and the possible interaction of the concentration gradients developed around adjacent particles; i.e., soft impingement. The isothermal dissolution measurements were bounded by predictions from simulations with and without the soft-impingement assumption. Similar trends were found for continuous-heating behavior. In particular, slow or fast heating-rate observations were replicated by simulation predictions with or without the soft-impingement constraint, respectively. 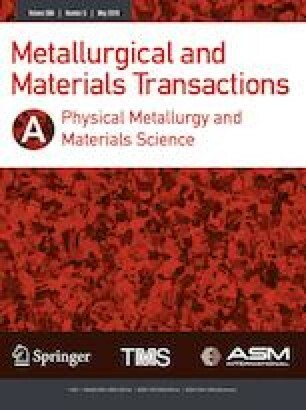 This work was conducted as part of the in-house research of the Metals Branch of the Air Force Research Laboratory’s Materials and Manufacturing Directorate. The support and encouragement of the laboratory management and the Air Force Office of Scientific Research is greatly appreciated. The synchrotron measurements were performed at the Cornell High-Energy Synchrotron Source (CHESS) which is supported by the National Science Foundation under Award DMR-1332208. The yeoman assistance of P.N. Fagin, J.O. Brown, T.M. Brown, and C.P. Lingane in conducting the experiments is gratefully acknowledged. Technical discussions with Dr. T.F. Broderick (GE Aviation), Dr. S.S. Babu (University of Tennnessee), and Dr. P.E. Markovsky (Institute for Metal Physics, Kiev, Ukraine) are also appreciated. Two of the authors (NCL, JMS) were supported under the auspices of Contract FA8650-15-D-5230.